Ever look at what you do with your time? What is your purpose with that time? Do you get so busy that you forget the reason of it all or are in danger of doing that? I worry that I walk the line on that one. My free time is steeped in Bible study on topics, studying apologetics, theology, serving in various ministries, lessons, and these posts. Since January, I’ve gained friends, enjoying down time with them. Almost every day, I spend quiet time in the Gospels, finding it most relaxing when I hand-copy passages. I do not, however, spend time just talking to God alone, without interruptions; it is generally just constant chatter throughout the day. I would say there should be a balance except not quite. 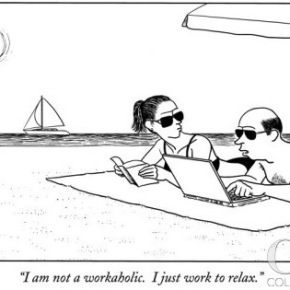 Workaholic or worship? Trying to live a good life or focus on the good and it spills out naturally. Jesus says, “Are you tired? Worn out? Burned out on religion? Come to me. Get away with me and you’ll recover your life. I’ll show you how to take a real rest. Walk with me and work with me—watch how I do it. Learn the unforced rhythms of grace. I won’t lay anything heavy or ill-fitting on you. Keep company with me and you’ll learn to live freely and lightly.” From the Message translation of Matthew 11:28. “Paradoxically, we don’t do enough good because we do too much good. That means two things: first, we are Marthas, worrying about many things, instead of Marys, simply loving “Jesus only.” And second, we try to do it ourselves, asking God for “help,” instead of realizing Step One of any Twelve-Step program, that we can’t do it ourselves. Jesus has to do it. Our resources are tiny, His are unlimited. A saint is a soldier who has burnt all his bridges behind him and sees “Jesus only” ahead of him. I do not want to be considered a “saint”. I just want to live for something more and good. I spent years building monuments to myself, proclaiming how smart I was, and learning the hard way that I have no real control. In a discussion with my wife’s grandmother, she struggled to find a nice way to describe it, so I said “full of myself?” “We’ll go with that.” She replied. 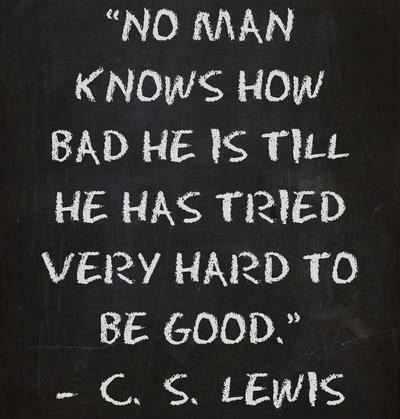 From there, I would try to make myself good, and I couldn’t consistently pull that off. August 10 was my rebirthday, the day I stopped using my own effort a year ago. I find when I don’t try to do anything more than ‘love God, love people,’ I supernaturally do well. It feels effortless; my tone and mannerisms change when I interact with others. Just reflecting the loving-kindness – tender kindness motivated by or expressing affection — that I was shown. Be it reassuring a friend, encouraging a new employee at work who showed me something new, quietly helping an elderly relative to her car while speaking of spiritual things; things that are not my strengths. Those lie in studying and writing, not expressing love, kindness, and gentleness; those come from walking in the Spirit. Less doing for and more loving.